(Portland, Oregon) – Canada's most beloved – and most foulmouthed – stars are showing up in Portland Tuesday for an almost-secret gig as part of a movie preview. The Trailer Park Boys will actually be appearing live at a special screening of their new movie The Swearnet Movie at Portland's Cinema 21 Tuesday night, in what appears to be a mini-tour that is kind of a test run. (Above: Trailer Park Boys in Portland in 2011). The show happens tomorrow, October 22. The show will primarily be an early screening of the Swearnet Movie, with a small Q&A given by the main actors themselves: John Paul Tremblay (Julian), Robb Wells (Ricky) the hugely popular Bubbles (Mike Smith) and Patrick Roach (Randy). Tickets for the Portland screening and Q&A are $25 and available online only. Dropping one curious incarnation of obscenity after another, the troupe has attained an enormous cult status in the U.S. and the world since the beginning of the very low budget mockumentary-style show Trailer Park Boys began in Canada around 2001. It began under the aegis of producer Mike Clattenburg, but the main actors of the show split from Clattenburg in recent years. Since 2011, characters Julian, Bubbles and Ricky have gone it alone, but restarted the Trailer Park Boys franchise this year via a new online subscription network called Swearnet.com. There is little to no information what the Swearnet Movie is about, but many of the regular cast of crazed trailer park dwellers is joined by comedian Tom Greene in the movie – though it does not appear to be a Trailer Park Boys movie, per se. Portland has a huge fanbase for Trailer Park Boys, with their 2011 tour having to create a second show in the area after the first one sold out within hours. 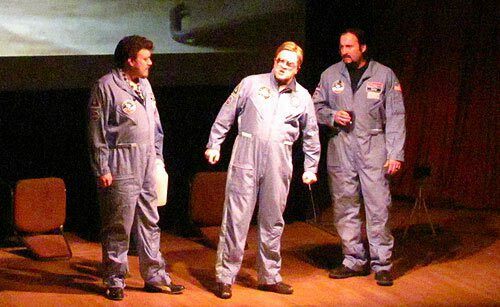 The Trailer Park Boys cast perform in Minneapolis, Mn., on October 23 at the Riverview Theater although that show is sold out. They perform the following evening at Chicago's AMC River East 21, although that show is sold out as well. As of 10 p.m. on Monday night, the Portland, Oregon event is not sold out.